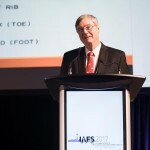 The week of August 21-25, 2017, I had the pleasure of attending the 21st Triennial Meeting of the International Association of Forensic Sciences (IAFS) in Toronto, Ontario, Canada. The opening ceremony highlighted the global span of the 1,440 delegates from 86 countries and 6 continents. IAFS President Michael Pollanen spoke to the growing reach of humanitarian forensic science in seeking the truth, supporting human rights, enabling justice, and improving society. Reflecting the meeting theme of “Inter-professional Collaboration in Forensic Science,” 109 individuals and organizations provided funds supporting the attendance of colleagues from lower and middle-income countries. Numerous AAFS members participated in the 2017 IAFS meeting as Faculty (Eric Baccino, Hee-sun Chung, Barry Fisher, and Doug Lucas), Plenary Speakers (Lori Baker, Maria Corazon De Ungria, Jose Lorente, and Duarte Nuno Vieira), and Invited Speakers (Frederick Bieber, Peter R. De Forest, Zeno Geradts, Roderick Kennedy, Pierre Margot, Michelle Miranda, Claude Roux, Douglas Ubelaker, and Sheila Willis). Many more were involved in the Pre-Conference Workshops and Scientific Program presenters. 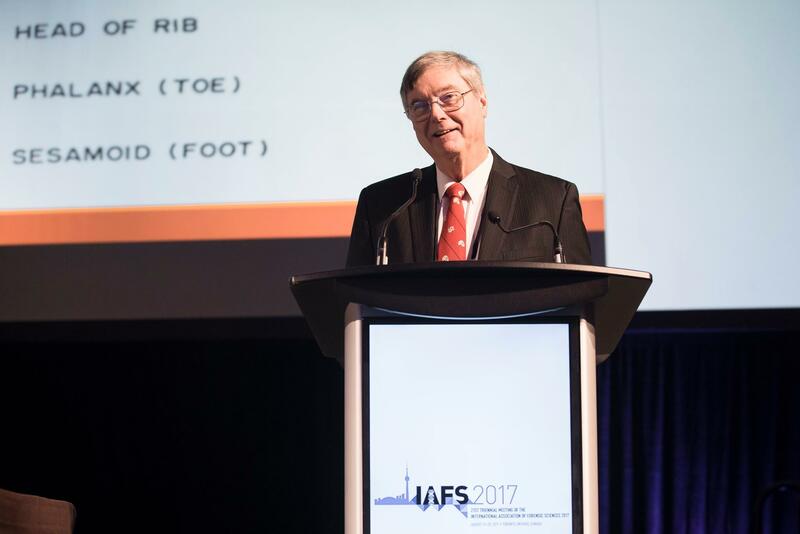 Additionally, Professor Claude Roux was selected as the 2017-2020 IAFS President, and the 2020 IAFS meeting will be held in Sydney, Australia. 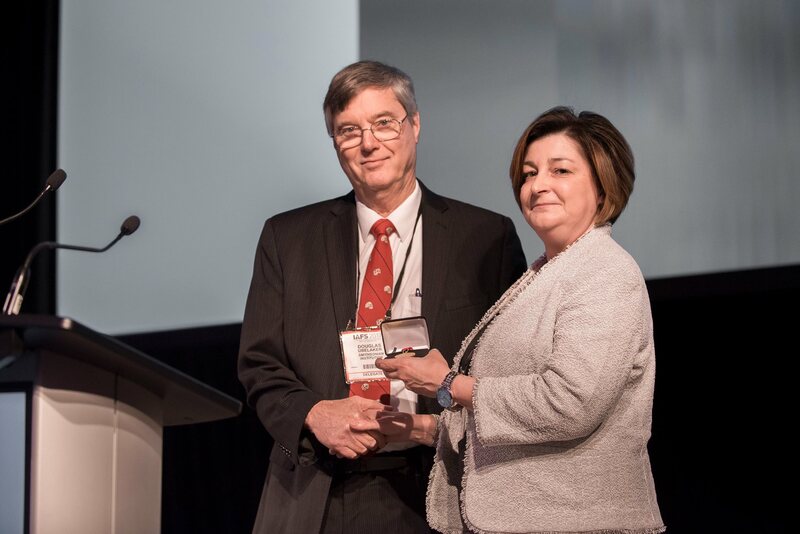 A personal highlight of the meeting was the opportunity to present the 2017 AAFS Douglas M. Lucas Medal to Douglas H. Ubelaker, PhD, for his significant international contributions to forensic science. I was honored to present the Lucas Medal to Dr. Ubelaker, not just for all of the wonderful things he has done, but for his inspiration and motivation of others. As the 7th recipient of the Lucas Medal, Dr. Ubelaker is the embodiment of professional and personal commitment to humanitarian and human rights in the global community. Dr. Ubelaker has served the forensic science profession for more than 40 years and is regarded as one of the world’s leading anthropologists. He currently serves as curator and senior scientist at the Smithsonian Institution’s National Museum of Natural History in Washington, DC, where he has been employed for more than four decades. Since 1978, he has served as a consultant in forensic anthropology and as an expert witness, reporting on more than 960 cases and testifying in numerous legal proceedings. He is a professorial lecturer at The George Washington University, Washington, DC, and is an adjunct professor with the Department of Anthropology, Michigan State University, East Lansing, MI. He has published extensively in the general field of human skeletal biology with an emphasis on forensic applications. He has served on the editorial boards of numerous leading scientific publications, including the Journal of Forensic Sciences; International Journal of Legal Medicine; Human Evolution; Homo, Journal of Comparative Human Biology; Anthropologie, International Journal of the Science of Man; Forensic Science Communications; Human Evolution; and Global Bioethics. the Lucas Medal to Douglas Ubelaker at the 2017 IAFS Triennial Meeting in Toronto. 2017 IAFS Triennial Meeting in Toronto. Dr. Ubelaker has been an active member of AAFS since 1974 and achieved the status of Fellow in 1987 in the Physical Anthropology Section. In 2001, the Section acknowledged his contributions with the T. Dale Stewart Award. Dr. Ubelaker has served on numerous AAFS committees throughout his tenure with the Academy, and ultimately as president in 2011-2012. He has served as a Journal of Forensic Sciences (JFS) reviewer for 26 years and as JFS Book Review Editor from 2008-2015. Dr. Ubelaker has served as the chair and editor of the Wiley/Blackwell-AAFS book series, Forensic Science in Focus, since 2012. Dr. Ubelaker’s professional activities have not been limited to AAFS, as evidenced by his involvement in numerous regional, national, and international forensics associations. He has received numerous honors including the Memorial Medal of Dr. Aleš Hrdlička, Humpolec, Czech Republic; the Anthropology Award of the Washington Academy of Sciences; the Federal Bureau of Investigation (FBI) Director’s Award for Exceptional Public Service; the Federal Highway Administration Pennsylvania Division Historic Preservation Excellence Award; a special recognition award from the FBI; the Hong Kong Forensic Foundation Award; and was elected Miembro Honorario by the Sociedad de Odontoestomatólogos Forenses Ibero Americanos in Argentina; Profesor Ad Honorem by the Faculty of Medicine, Universidad de la Repύblica, Montevideo Uruguay; Socio Honorario by the Asociacion Latinoaméricana de Antropologia Forense; Honoris Causa by the Forensic Anthropology Society of Europe certification committee; and Doctor (Honoris Causa) by the University of Cordoba, Argentina. The meeting also provided an opportunity to emphasize one of Dr. Ubelaker’s recent contributions to human rights, his service as Chair of the AAFS Humanitarian and Human Rights Resource Center (HHRRC) that was inaugurated at the 2015 AAFS meeting in Orlando, FL. The HHRRC Center seeks to promote the application of contemporary forensic science and forensic medicine principles to global humanitarian and human rights projects requiring special assistance. The Thursday Plenary Session, supported by the HHRRC, featured perspectives on working in challenging environments. The session promoted the work of HHRRC grant recipients and highlighted ways to apply for grants and to donate to support the HHRRC through contributions of funds, expertise, equipment, and other resources. Dr. Ubelaker’s leadership of the HHRRC has enabled us to support projects in areas of need around the world. We are part of a global community. Through AAFS and our collaboration with other professional organizations such as IAFS, we sharpen our skills to strengthen forensic science capacity worldwide. Our work is a valuable tool in the pursuit of justice and the protection of human rights. 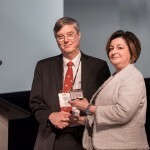 Please consider contributing your expertise or resources to the AAFS Humanitarian and Human Rights Resource Center to continue the inspirational work of Dr. Douglas Ubelaker, the 2017 Lucas Medal recipient.